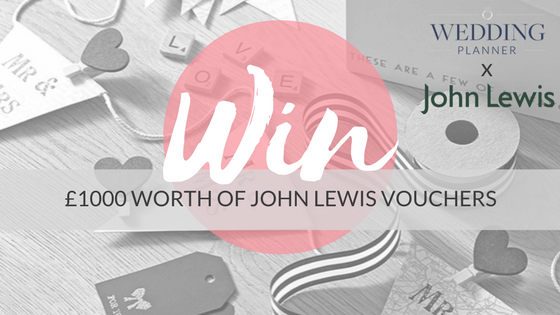 Whilst money may be flying out the door as you get into the full swing of wedding planning, we thought we'd help you out a little with the opportunity to win £1000 worth of John Lewis vouchers! You are SO welcome. And how do you enter this wonderful competition we hear you ask? It's so simple, all you need to do is sign up free for the John Lewis Gift List and let us know your Gift List code in your Wedding Planner Tools, so read on to know all the necessary details and apply. It's free and super easy to register, just click here to go to their website and enter the necessary details - they'll then send you some more information (plus a free tea and cake coupon for any of their stores!) in the post! The competition runs until and including the 28th February 2017. Once John Lewis have pinged you your Gift List code, you need to log into your weddingplanner.co.uk account (if you don't have one you can sign up here!). Go to 'My Planning Tools' and click the 'Account' tab. You will find a section as pictured below to tap in your Gift List code. 3. Voila, you've entered! We have everything crossed for you! Tah-dah, all done! Told you it was easy didn't we?! Any queries, feel free to email me at lucy@weddingplanner.co.uk and we wish you the best of luck!